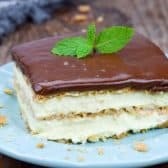 This no bake Eclair Cake is easy to make and is always a hit! This easy creamy cake is topped off with a simple chocolate glaze for a totally irresistible bite. In a medium mixing bowl, blend together instant vanilla pudding mix and milk. Using a hand held electric mixer, beat for 2 minutes, on medium speed. Gently fold in Cool Whip. In a 9 X 13 inch dish, lay a single layer of graham crackers, cutting as needed, to cover the entire bottom of dish. Evenly spread half the pudding mixture over graham crackers. Lay a second layer of graham crackers, fitting as needed, over the pudding layer. Pour the remaining pudding mixture over graham crackers. Lay a final layer of graham crackers, fitting as needed, over the pudding. In a medium microwave safe bowl, add the butter and milk and heat just until butter melts. Add cocoa, powdered sugar and vanilla. Using a hand held electric mixer, mix until glaze becomes smooth and there are no longer any lumps. Pour glaze over top layer of graham crackers, using an offset spatula to cover top smoothly. Cover dish with plastic wrap and place in the refrigerator overnight.